Both Brexit and Trump are reactions to irresponsible politicians. Just like Hugo Chávez was in Venezuela in the 1998 election, for which the people now pay a huge price: Dictatorship, or rather pure tyranny, with Holodomor and Holodolencia (the regime preventing access to food and medicines). But back to Brexit and Trump. Western Europe and USA are part of the same culture, which since WWII has created a global system in which intervention in other countries is prohibited except as permitted by the UNSC, but due to the veto powers that body rarely allows such moves. This means that the global community protects governments, even in the case of regimes that are un-democratic and lack support among the population. This has given oppressive regimes a free hand to do what they do best: Repress, rob, steal, and deprive people of hope, while holding up a pretty facade in the diplomatic arena. It’s hard to call it corruption when it is the very essence of what they do. Since the free world has chosen to tie their hands, the people living under oppression and the violence that repressive regimes lead to, have had no other recourse than to flee to the free world if they want opportunities for themselves and their children. From Latin America they risk their lives to come to the U.S., and from Africa they risk their lives to come to Europe. Both regions have chosen to accept these refugees rather than taking effective action to improve things in their home countries. In Europe it has for decades been politically incorrect to even question the policy of accepting the refugees rather than try to help them achieve freedom of opportunity at home. So people have gotten fed up. That’s how I interpret Brexit and Trump: Both Brits and Yankees are tired of the lack of political will to deal with the real problem, and so they do something desperate that actually can make things much worse. Look at the countries from which the refugees come. Third world countries tend to have a filthy rich elite and a large poor population that does not have opportunities to get ahead, regardless of education, because of corruption. The wealth of the rich is such that they even can bribe leaders of the free world, and nobody will be the wiser because there is no control or oversight in these countries I’m talking about. The international system needs to take the focus away from preserving the Status Quo and the sitting government, and focus on getting effective human rights such as freedom and opportunity to the people. As one example of a policy area where a new tack may be needed I’d like to mention weapons control. The right to rebellion against a tyranny is a fundamental right that predates civilization itself. But the right to rebel is only a chimaera when citizens are denied the right to bear arms. For many years the international community has worked towards limiting international arms traffic to prevent weapons from falling into the hands of criminals, leaving the government in total control. That is good and well, but what about if the government is the criminal, leaving the potential rebels with no recourse? That’s what makes people flee to USA or Europe, because they have no way of fighting back, and the west will not help them in any way, shape, or form. For 6 years I’ve followed the Venezuelan people’s fight for freedom from the dictatorship that controls their country since 2002, when the military reinstated Chávez as president after a non-violent movement had forced his resignation by peaceful protests. The dictatorship deliberately disarmed the people, and armed criminal gangs loyal to them—the Venezuelan version of Brownshirts, called “colectivos.” In 2014 the colectivos met peaceful protests with guns, for instance. Any rebellion will need to be able to neutralize the armed colectivos, but where to get the necessary weapons? There is no legal way that the rest of the world can help, and apparently no country wants to do it illegally either (since if so, it would already have been done). This leaves the Venezuelan people at the mercy of a regime that denies them food and medicines. Yes, denies: The regime does not allow these things even to be donated from abroad. What recourse does the Venezuelan have? His choices are to starve and possibly die; to fight unarmed against one of the heaviest armed nations in the Western Hemisphere; or to emigrate. Millions have already taken that las option and many of them are now homeless abroad, but at least not denied food. There is something fundamentally wrong when the international community helps the despots against people with a legitimate right to rebel. In a landmark meeting yesterday, the Organization of American States were summoned to an extraordinary meeting for the presentation of a report on the erosion of democracy in Bolivarian Venezuela, prepared by the secretary general of the organization, Luis Almagro. The meeting started with the point of order of approving the agenda, to which Bolivarian Venezuela, represented by its foreign minister Ms Delcy Rodriguez requested the word. She expressed that her country was opposed to the meeting being held. 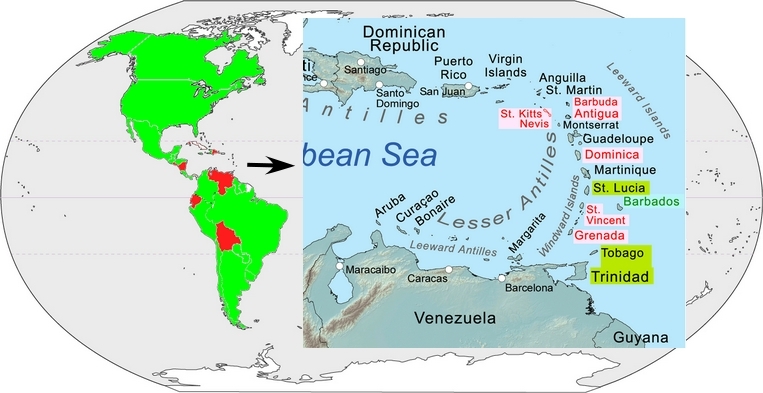 After the US made a point of order saying that Bolivarian Venezuela had gone into the subject matter when they were at a point in the agenda where only points of order were allowed according to the rules of OAS, and a couple of more violations to thus rule by Nicaragua and Bolivia, the vote was taken. Do you approve the agenda? 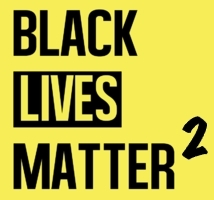 That makes 21 in favor and 11 opposed, with 2 abstentions, so the agenda was approved and the meeting started. The only point of order was that Luis Almagro, secretary general, presented his report. That was followed by comments by those who so wished. All countries availed themselves of that opportunity except those in italics in the above table. The complete video of the entire meeting (except 2 minutes before the formal start, due to a transmission error) with the original language (no interpreter voices) is available on the Operación Libertad Venezuela YouTube channel. For Spanish speakers I recommend ‘The pearls of Delcy Rodriguez,’ “Las perlas de Delcy Rodriguez,” since nobody contributed more to prove the case that Bolivarian Venezuela is an authoritarian regime than the foreign minister herself. I don’t have the time to translate it but I will leave it open for user-contributed translations on YouTube. The fact that the report was presented was a huge step forward, because the regime’s lies were exposed publicly. But this is not to say that the democratic charter was activated. This was just the secretary general informing the countries—his employers, effectively—that “here is something I think you need to look at”. Now they need to consider the facts and then it is up to the country holding the presidency of OAS to decide if and when to call a new meeting. At present Argentina holds the presidency. The votes whether to approve the agenda or not in OAS on June 23, 2016. Countries supporting Venezuela voted no to try to prevent the report about erosion of democracy from being presented, here marked in red. Yellow marks abstentions and green in favor. Pirates of the Caribbean will decide the fate of the OAS—and their own future on the international arena. On Thursday June 23rd, the OAS will vote. If they fail to activate the Democratic Charter against the patently genocidal regime in “Bolivarian” Venezuela, the organization will lose all international credibility. 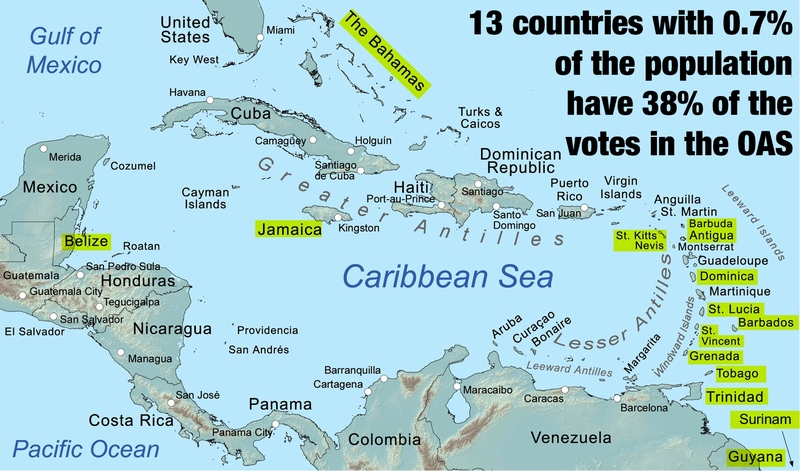 The countries in whose hands it is to decide the vote are the Caribbean ones. They are also the ones who gave the Spanish language the word “filibustero” from their ways (filibustero comes from Dutch fribuiter which means free-looter in English and fribytare in Swedish, and refers to pirates who operate under the premise of take what you can). 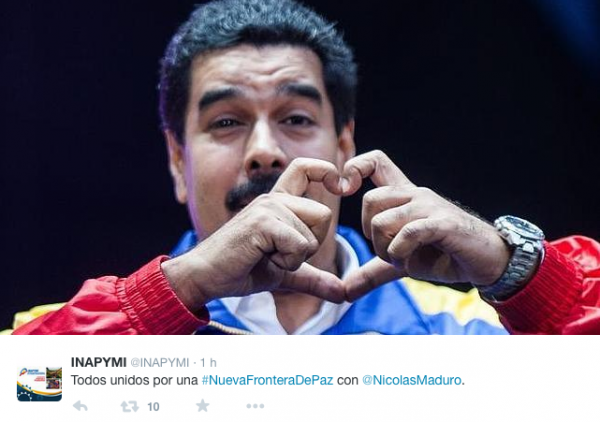 In these days they take blood-money from the genocidal regime in Caracas, so their moral has not improved. The vast majority of the people in the Americas, something like 90%, live in countries that support activating the Democratic Charter. But 0.7% of the population has over 38% of the vote and thus the power to protect the genocidal regime of Maduro. What’s more, 9 of those so-called countries have the same head of state, Queen Elizabeth II, so much of the shame will fall on the queen of the English if they fail to exercise their responsibility to protect the Venezuelan people against Crimes Against Humanity and Genocide. The rest of the Americas would be wise to sideline those countries in any future organization of American states, because they would obviously have failed the test of being mature enough to operate on the international arena. Maybe they could be given one vote between all of them, like the 50 states of USA have. 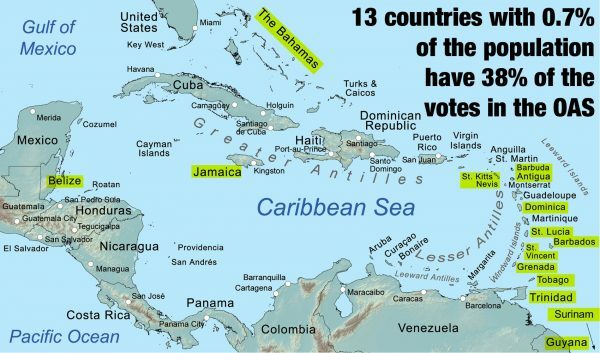 These 13 countries have 38% of the vote, well above the 33% that is needed to shield the genocidal regime in Caracas. In fact, it’s enough that 10 of them back the Maduro regime, and the 10 smallest represent only 0.2% of the population in all OAS countries. Nobody is allowed to commit crimes against humanity or genocide. They are international crimes and they are never prescribed. Furthermore, states have the responsibility to protect their citizens from these crimes. In 2005 the world community decided that if a state fails to protect its citizens from crimes against humanity, genocide, ethnic cleansing or war crimes, the international community has a responsibility to protect, and that the UN Security Council has a right to decide to intervene and override the sovereignty of that country. But what to do if a state itself commits crimes against humanity or genocide, and the international community fails to act? Clearly as individuals we the people still have a moral obligation to act. When faced by a situation like the one in Venezuela, where the regime deliberately is starving its people to try to stave off a rebellion (like Stalin did in Ukraine in 1932/33, the original Holodomor), a situation where people have to choose between dying of starvation or taking up arms against the regime, and the regime is armed to its teeth while the population was disarmed years ago, plus the regime uses heavily armed criminal gangs called “colectivos” to spread terror against those who protest for food, what options do we in the civil society have? All non-violent methods have already been tried, but non-violence does not work against a regime that does not care if dissidents die. In 2010 Franklin Brito went on a hunger strike until he died and what did the regime do?, they made sure he died. In 2014 unarmed people protested all over the country and the regime used live ammo, which provoked a response by criminals (the only civilians with guns). Apparently unreported by media, 55 soldiers were shot during the “non-violent” protests in legitimate self defense. How many of these soldiers were Cubans is not known, only that Cuba sent 60,000 troops to quell the rebellion. The Venezuelan people is fully aware that the only way to get out from this tyranny is through the use of force, but they also realize that the regime advantage in weapons and armaments is a hundred to one or a thousand to one. It’s one of the worlds heaviest armed regimes, a criminal regime, against a population that does not even have the right to own weapons (although many criminals do anyway). So its criminals against criminals, with those wanting peace and the rule of law having no power whatsoever. Because they allowed themselves to be disarmed. The first lesson is of course that The People should always make sure that they have a legal right to own weapons, to prevent tyranny. In my opinion hunting rifles that can function as sniper rifles is the best protection because they allow for the creation of a home guard milicia, and at the same time they are virtually useless for criminals. In places high in crimes they can also work for home defense with appropriate light load ammunition to prevent over-penetration. I’m talking bolt action or single-shot, not semi-automatic. For close encounters the milicia could use semi-automatic pistols, but since they are very sought-after by criminals it would make sense to restrict them more. The milicia could instead use pump-action shotguns, another weapon useful for home defense but of little use to criminals. An armed citizenry is crucial as a way to prevent internal enemies from taking over the country. However, in the case of Venezuela this discussion comes too late. They already allowed themselves to be disarmed and invited the Devil by voting for Chávez in 1998. They are already facing crimes against humanity from their own (illegitimate to be sure) regime, including arbitrary detentions, torture, disappearances, assassinations, Holodomor (genocide by starvation) and Holodolencia (genocide by denying basic health services and medicines). The forces of repression include the police, the national guard (part of the military), and the Venezuelan version of the brownshirts, the colectivos, fanatics who ride on bikes and spread terror. They are used for propaganda reasons, to avoid pictures of uniformed personnel committing those acts of terror. The propaganda is a key ingredient in the regime’s arsenal, and it is used to avoid that the international community acts against its crimes against humanity. In 2014 the non-violent uprising that was met with military force did not ebb out until the civilians ran out of ammunition. For over a month they had control over one state in Venezuela, Táchira. When the regime re-took control it was a full military operation with tanks, close air support, the works. The resistance still bills it as a non-violent uprising because it was not their choice to make it an armed conflict. Now, starting last Tuesday, June 14th, the resistance called for rebellion again, with the call coming from Cumaná, Sucre state. This time everyone is clear that the rebellion must be armed and that the colectivos must be met with deadly force. The instructions to the civilians include to barricade themselves in their homes and to meet any intruder with force, colectivo or national guard, because they know from experience that their intent is to kidnap, torture, and murder. In this situation the international community has a difficult choice: Do nothing and watch people being exterminated, or break the law to help them. 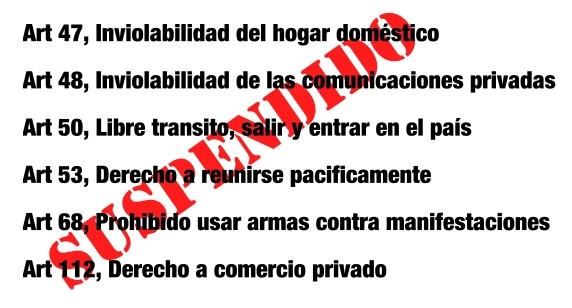 The OAS is prohibited from intervening, so the Democratic Charter is a paper tiger. And even so, it may not be activated since so many countries in the Caribbean area are political prostitutes who vote to defend the genocidal regime in Caracas, taking Venezuelan blood money. The UN Security Council is the only international organ that is authorized to call for intervention, that is, actions that violate the national sovereignty. Note that even the air drop of food to starving people violates the national sovereignty. But it may be necessary very soon, since the regime is firm about not allowing humanitarian aid (it is also forbidden to send food or medicines to the country, if it is found in shipments it is confiscated and destroyed). But the UNSC is very unlikely to vote for such a resolution since China and Russia are traditional allies of the regime, and both have veto power. This leaves only one avenue for international assistance and that is to smuggle help into the country. The things they need for survival are food and medical supplies, and to defeat the regime they also need ammunition as a minimum. But here one runs into ITAR, the rules prohibiting arms trafficking. So the unarmed and defenseless people can not be helped by the international community because of rules that were designed to prevent the bad guys from getting weapons. 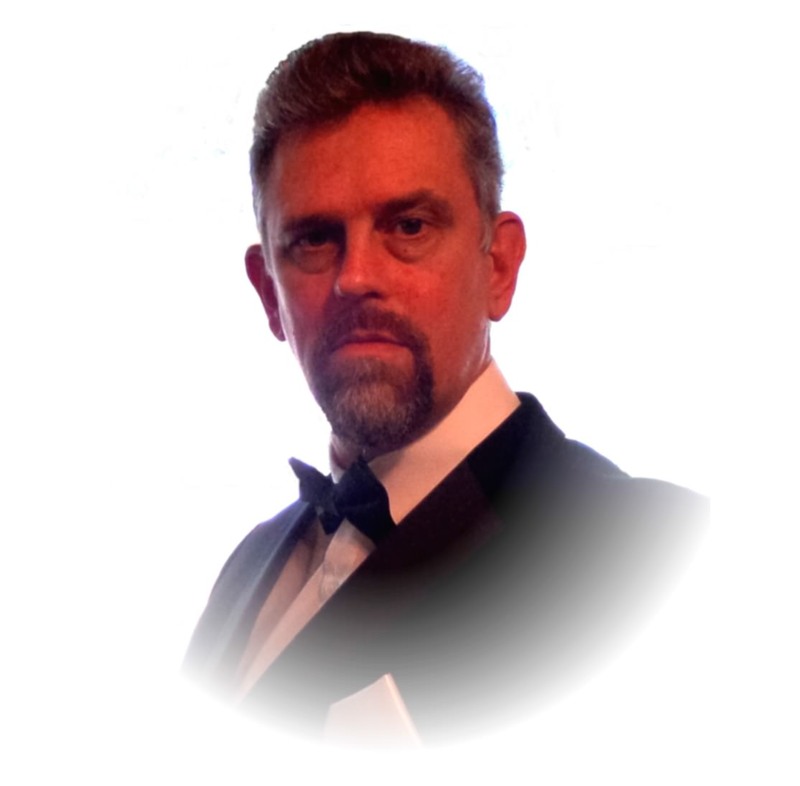 In this case, when the bad guys are in power, the rules instead help the bad guys commit crimes against humanity. My conclusion is that the international community has a responsibility to protect the people of Venezuela and that this justifies certain violations of ITAR, since obeying by all the ITAR prohibitions of arms smuggling would aid and assist a Crime Against Humanity. In Venezuela the regime is executing a deliberate policy of extermination by the denial of access to basic health care and medicines. This leads to a large amount of preventable deaths in many diseases, from tropical fevers leading to death by lack of acetaminophen, to cancer for lack of treatment in the early stages. The deaths are not random but are used as a political tool against dissidents. The regime is also executing a Holodomor, extermination by starvation, but that seems to be less effective, probably because in the tropical climate of Venezuela there can be many harvests a year; unlike Ukraine, where there is only one, and the regime successfully confiscated all seeds during the winter. I suggest the term “Holodolencia” in analogy with “Holocaust” and “Holodomor”. Holocaust is from Greek and means “all burned”, and Holodomor is from Ukrainian and means “starvation-murder”. The word Holodolencia is created by keeping “holo-” from the previous words for genocide, and adding the Spanish word “dolencia” which means ‘disease,’ ‘illness,’ since the genocide consists of making a not very serious condition lethal by denying basic health care. The method by which the regime is denying basic health care is as follows: First, declare that health care is a human right that all should have. Second, declare that the government shall be responsible for it, and create a national system but designed to support the regime base only. Third, take control over all imports and manufacturing of supplies to the private clinics, and deny them supplies and medicines so that they gradually stop functioning and have to cease their activities. At present, the regime is prohibiting the import of medicines, it is actually forcing importers to burn medicines, and it is denying import for humanitarian reasons. Donated medicines that arrive to hospitals are ceased and destroyed. Predictably, the deaths are sky-rocketing. This Holodolencia may be more effective in Venezuela than the simultaneously executed Holodomor. One hundred years ago today, Sir Ernest Shackleton set out on a rescue journey from Elephant Island, the Antarctic, in the 22 foot lifeboat James Caird, to the whaling stations in Grytviken, South Georgia, over 700 nautical miles away (over 1300 km or 800 statute miles). With a crew of five sailors, supplies for 4 weeks, he set out in a rescue operation to get help for the rest of the crew who had been stranded in the Antarctic since their ship Endurance sank in the pack ice on November 21, 1915. The expedition had left South Georgia on December 5, 1914. 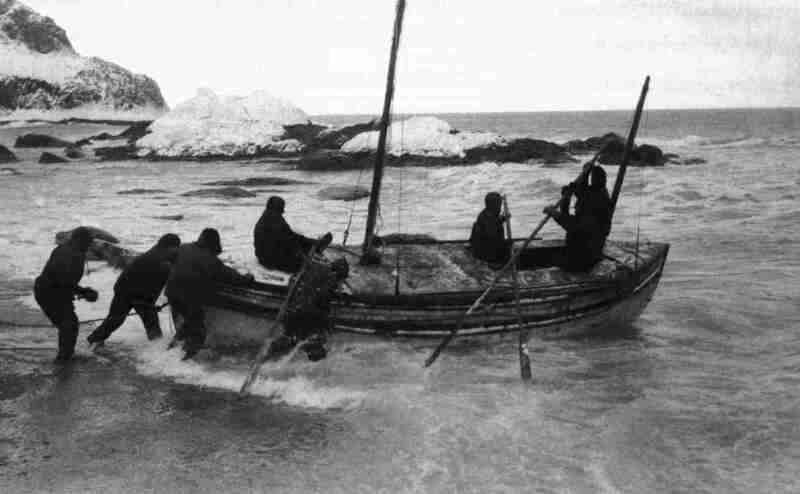 My grandfather was a whaler in Grytviken from 1919 to 1921 so I heard the stories directly from someone who had been on South Georgia—although he didn’t arrive until after Shackleton had left, and he left before Shackleton returned in 1922 only to die from a heart attack and be buried in Grytviken. Launching the James Caird on Elephant Island, April 24, 1916. 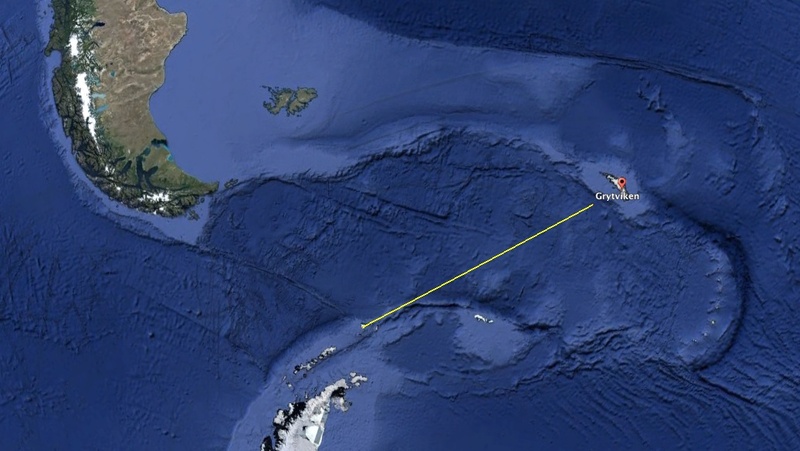 Miraculously the James Caird arrived to South Georgia after 17 days on the roughest ocean of the world, the Southern Ocean. This was beyond the Roaring Forties, this was the Screaming Fifties, as the whalers on South Georgia knew it. They had to ride out hurricane-force winds in view of the island before they could land. But they landed on the west coast, and Grytviken is on the east coast. A smaller team of three made the crossing over the glacier-covered mountains, making the 51 km in 36 hours. From Gytviken a boat was sent to rescue the other 3, and the remaining 22 men on Elephant Island were rescued on August 30, 1916, with the assistance of the Chilean navy. The journey from Elephant Island to South Georgia (Sydgeorgien). For more information about Sir Ernest Shackleton see this Wikipedia article. By the way, Grytviken is a Scandinavian word that means “pot bay” and was so named because that’s where they boiled the whales. While whales were still processed on shore, there was government control over the harvest, but later in the 1920’s floating whaling stations were built, and that is what totally destroyed the whale populations. In the 1930’s and forward my grandfather, Knut “Attarparn” Nilsson, was an advocate against this form of whaling because he had seen first hand how harmful it was to the whale stock. The people of Venezuela don’t want Maduro as president. In fact, the opposition has been a majority since 2002, but the regime has stolen the elections to hold on to power. In the parliamentary elections on Dec 6, 2015, the opposition won an absolute majority but only because the military threatened a coup d’état if the regime stole more votes than required to hold on to just under one third of the seats. However, since then the executive has made it abundantly clear that it has no intention of respecting the parliament or the laws it passes, and has ordered the supreme court to strip the parliament of its powers. At the same time the regime continues its blatant violations of human rights, amounting to prima facie crimes against humanity, for instance the butchering on 28 persons in a mining town and the parading of the chopped up corpses in town to saw fear. Witnesses say that this was done by the governor’s police force. Non-violent struggle could have been effective but it is failing in Venezuela for lack of resources. It is impossible to rally enough people because of lack of basic resources for communication, such as paper and ink for flyers. The rallying cries only reach a small minority, and most of them stay away out of fear. Social media have been stifled too, by a law making it illegal forwarding the messages from the non-violent resistance. After a decade of harsh punishment for any dissent, the fear is deeply engrained. The punishment is a matter of life or death. Just yesterday an acquaintance died 5 days after running out of medicine. The regime is withholding medicines and urgent medical care from dissidents. This amounts to a genocide of political opponents. A Holodomor by starvation is also being executed, but with less success: The regime has tried to ration the food like Staling did in Ukraine in the winter of 1932, but Venezuela is a tropical country with harvests year-round in less than two months from sowing, so it’s hard to starve its people to death. One of the reasons why Gene Sharp developed the non-violent method as an alternative was because it would be cheaper and more feasible, lacking access to weapons. However, in Venezuela the regime has managed to all but eliminate the availability of resources for non-violent struggle, while at the same time inundating the country with weapons. It has the world’s highest murder rate, and most of it is by handguns. The slum is full of weapons. They have told me it’s easier to buy military explosives in the slum than it is to buy food! This combination of utter despair, and the armed struggle being relatively more feasible in relation to non-violent struggle, means that the balance has shifted. The non-violent struggle in 2014 was beat down by hard military force. The Venezuelan people had to make a strategic retreat in order to arm themselves. Unless the regime sees the fiery script in the sky and dramatically changes strategy, war is probably coming to a South American country near you pretty soon. On the south shore of the Caribbean Sea a totalitarian communist state is new being consolidated. On August 19th, Venezuela’s dictator Nicolás Maduro introduced a State of Emergency in five municipalities on the border to Colombia, and closed the border. He also started expelling Colombians from all over the country. Six paragraphs of the constitution were suspended. Apart from the usual four (the inviolability of the home, the right to private communications, the right to freely move about and to leave and enter the country, and the right to peacefully assemble) two more were suspended: The prohibition against using firearms and chemical weapons against peaceful protesters, and the right to do business. On the night of September 7th, this was extended to three municipalities in the northern end of Zulia state. The following day the regime (using a combination of twitter bots, hired staff and supporters who are being systematically brainwashed in workshops) launched the hashtag #CierreTotalDeLaFrontera (total closure of the border). The next day (today) they launched #NuevaFronteraDePaz (new border of peace), suggesting that peace will be achieved by closing the border. They conveniently forgot that the violence of the past largely was caused by the regime allowing several Colombian terrorist groups to have their bases on Venezuelan soil (FARC in Zulia state, ELN in Apure state). Furthermore, the smuggling that they want to stop, was carried out with the permission of the armed forces, who charge a fee for each load. In other cases it was the military themselves who did the smuggling over the border, closing it down for a few hours to have the zone for themselves. Nicolas Maduro is implementing the same policies in Venezuela that Joseph Stalin did in the Soviet Union, and which led to the Holodomor, genocide by starvation. While this is going on at the border, the regime is also cracking down on the private vendors who have been buying at government stores at regulated prices, and resold it at free market prices. These so-called bachaqueros have been sharply attacked by the dictatorship, accusing them of causing the shortage of regulated products, an accusation that the average Venezuelan does not buy into. Eighty “bachaqueros” were arrested in Puerto La Cruz, Anzoategui, the other day for “speculation” and their merchandize was seized. It seems that all except the communists themselves consider the shortage to be caused by the following government policies: The regime confiscating and closing farms so that the domestic production decreased to a trickle; the regime confiscating food production companies and running them in a very inefficient way; the inflation and the unsustainable exchange rate and lack of hard currency, which has meant that farmers and producers are unable to import necessary spare parts and raw materials, thus further decreasing production; and the regulated prices which means that the producers are unable to charge enough to cover the cost of production, thus further decreasing output. All the actions the regime is taking to “solve” this problem are related to distribution (prohibiting transporting food, prohibiting the stockpiling of food, rationing sales, price control), while none is aimed at increasing production of food, or enabling the importation of more food by improving the trade balance. Venezuela is a narco-oil-state that has been heavily armed by Russia and China, and is backed up by the security services of Cuba and Iran. The leadership has become outlandishly rich by systematically skimming the oil revenues, and by engaging in drug trafficking using the military and other state resources. Just one example, one of Hugo Chávez’s daughters allegedly has a fortune of $4 billion dollars, with a B. The development of Venezuela under Nicolas Maduro resembles quite a bit the development of the Soviet Union under Joseph Stalin. After a few years under the 1920’s when Stalin allowed “bachaqueros”, they were cracked down on in the early 1930’s. Just like in Venezuela today, people were prohibited from storing food, from transporting food, from traveling, and from doing private enterprise. In the Soviet Union this policy led to the Holodomor with around 10 million dead. In Venezuela the food shortage has been present for years but is gradually deteriorating. The new policies, which allegedly are introduced to solve the problem, instead run the risk of creating a holodomor in Venezuela, if nothing is done to stop this madness. Today the Greek people have voted whether to accept an economic help package from the EU and IMF. Judging from the incompetent way in which the marxist PM Tsipras has managed the negotiations, and now called this referendum in which he encouraged people to vote ‘no’, coupled with his attitude that Greece can get help from Russia and China instead, I cannot but suspect that the whole game plan from Tsipras has been all along to bring Greece out of Europe, and into the bosom of Putin’s neofascist Russia. For Putin it would be an enormous geopolitical victory to get Greece as an ally; the biggest geopolitical victory since conquering Ingermanland from Sweden so that they could build St. Petersburg there 300 years ago. 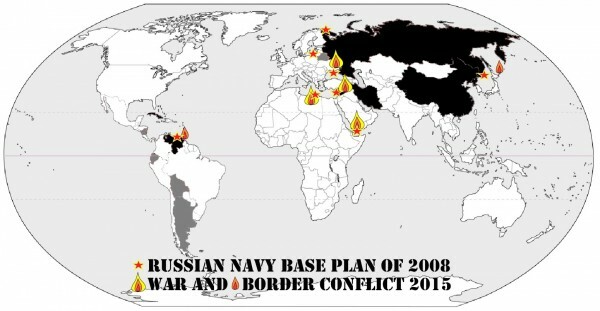 That victory gave Russia an access to the sea in the west, so that could build a Baltic Sea navy. Putin has now conquered part of Ukraine so that he can keep the navy base in Sevastopol, Crimea, but it is still cut off from the world oceans by the Bosporus, through Turkey. For that reason he has for years been striving to get a navy base overseas, in Libya, in Syria, in Yemen, in Venezuela. All of those have been frustrated, except Venezuela where it remains viable as long as Maduro manages to hold on to power – which he does at gunpoint. If he manages to lodge Greece away from the EU and later from NATO, he would drastically change the balance of power in the Mediterranean.